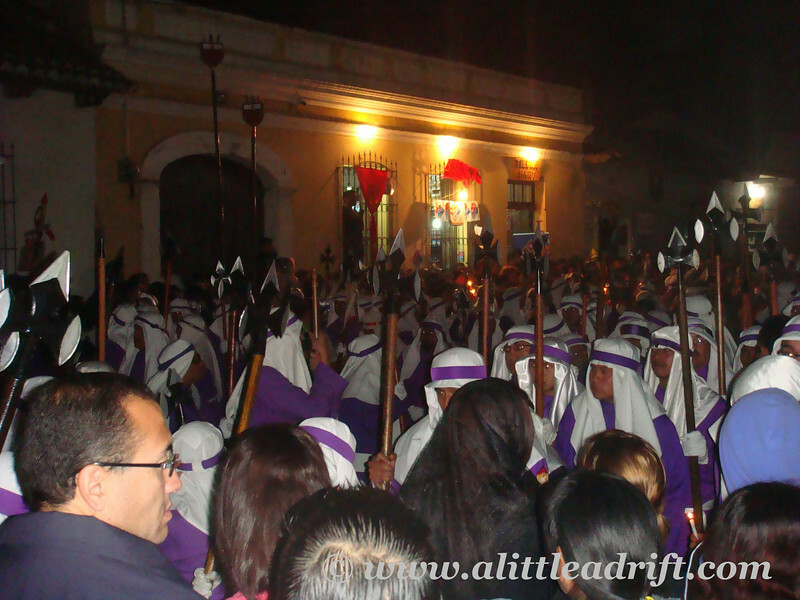 Semana Santa is among the best times to travel Guatemala, and many Catholic countries for that matter. Just as Buddhism, Hinduism, and other religions have colorful celebrations of devotion, sacrifice, and religious fervor (just look to the Holi Festival of Colors in India if in doubt), Semana Santa is a visible display of faith for a vast majority of Catholic Guatemalans. 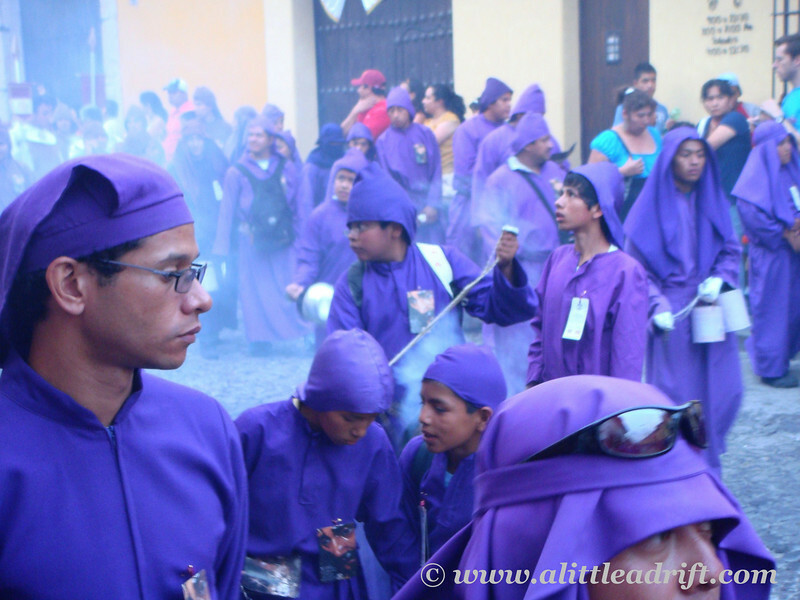 And by it’s nature, Semana Santa is an inclusive event for even the nonreligious—you simply need curiosity, cultural appreciation, and a fondness for festivals. 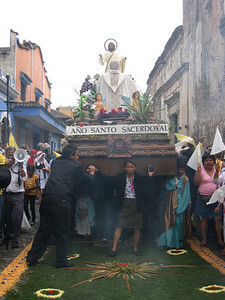 A tradition imported from Spain to Guatemala with the arrival of Spaniards in 1524, Semana Santa, or rather Holy Week, takes place during the entire week leading up to Easter Sunday. 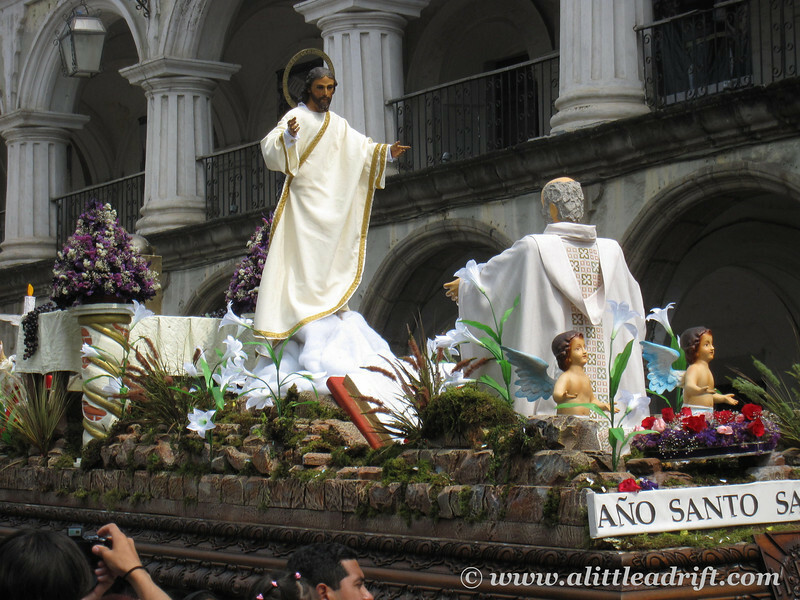 During Easter week, the Holy Week traditions of Spain are most internationally publicized, but Guatemala is fiercely religious and nearly 500 years after the Spaniards brought the tradition to the people of Guatemala, locals celebrate with as much fervent passion as those in Spain. 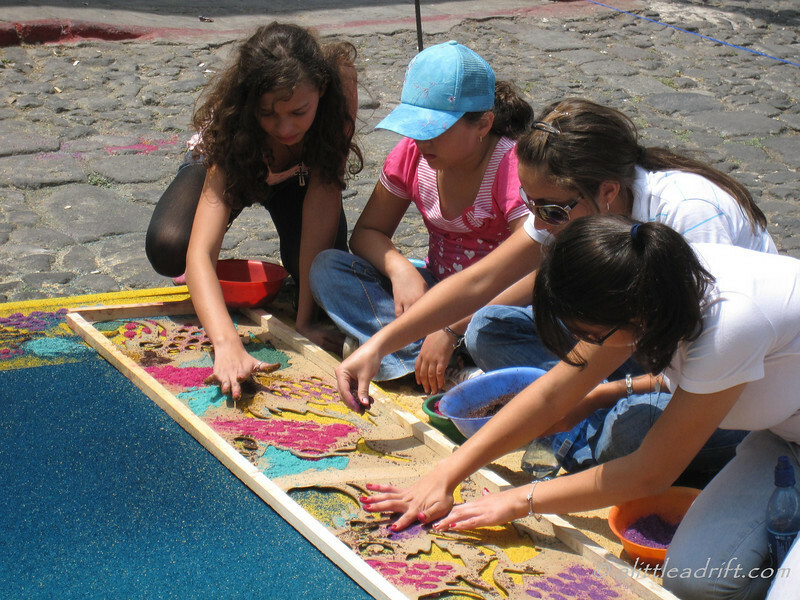 In Antigua, which is among my favorite towns in Central America, you can witness not only the religious processions unique to Guatemala, but also a fascinating—truly fascinating—collaborative process of making elaborate alfombras, carpets, that can span an entire city block and are the very definition of fleeting. 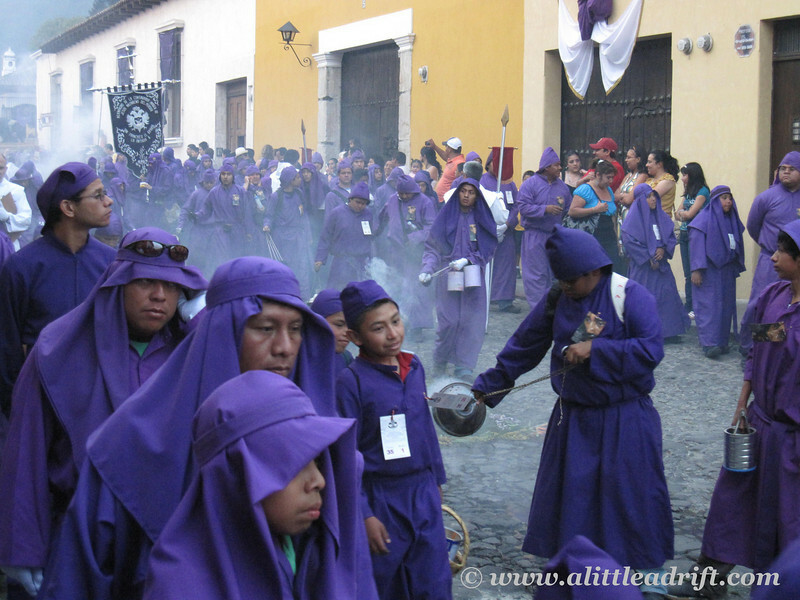 Many rites and rituals accompany Holy Week celebrations, and having spent the entire week in Antigua so I could witness it from start to finish, here’s a glimpse behind the curtains—a deep look at the traditions and history of Semana Santa in Antigua, Guatemala. 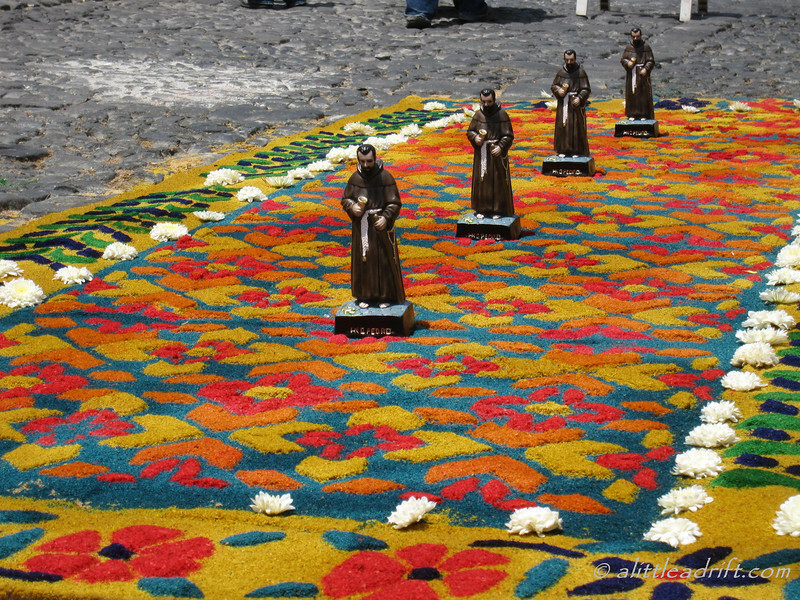 A carpet made of colored sand in elaborate designs, accented with fresh flowers and with holy figurines. The very first part of celebrating Holy Week actually begins in the weeks and months leading up to Easter. 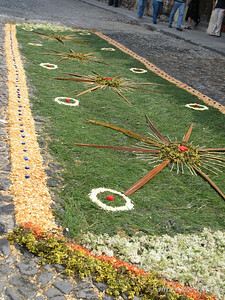 Semana Santa carpets are entirely unique in the world and something you can see only during Semana Santa festivities in Guatemala, Ecuador the Canary Islands, several cities in Spain, and a few other places influenced by Spain during its colonial era. And though called carpets, or rather alfombras in Spanish, they are only that in the larger sense of the world, because they are made form colored sawdust, flowers, and more temporary elements. While still deep in the throes of winter, neighbors and families partner up and decide on a design or theme for their offering that year. These carpets are masterpieces of artwork—the craftsmanship is truly stunning and families and neighborhoods take weeks and months just to plan out their carpets. 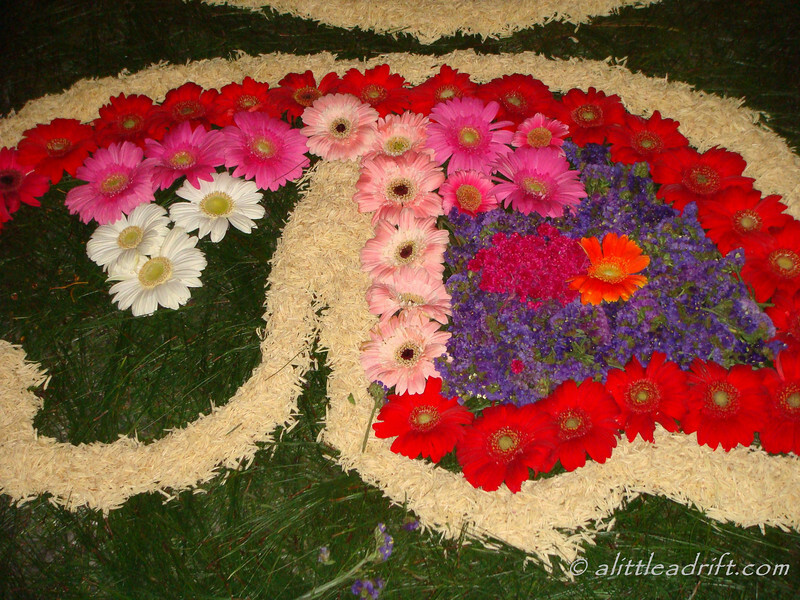 The intricate designs are new every year, although some family pass down traditional patterns through the generations. It’s a big deal not to just make the offering during the pre-Easter celebrations, but to do the best job possible with planning and prep work to secure the designs and materials ahead of time. 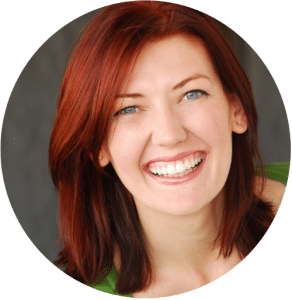 All involved share not just the effort, but the costs as well—the pigmented sawdust really adds up and the “sparkles” dusted overtop are incredibly expensive considering the scope of use on some of the carpets. By the time the first major parade kicks off on Holy Thursday, the carpets are completely planned and just awaiting the evening hours before Easter Sunday to become a reality. 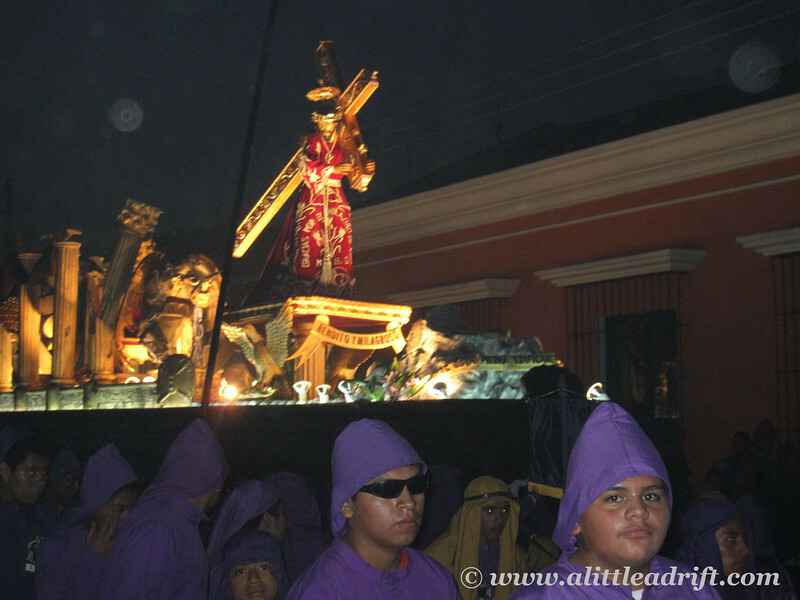 The long processions of floats comprise a major component of Semana Santa celebrations. Although you might think days of neverending parades sounds like fun, the processions mark a somber occasion since they specifically reenact the last days of Christ. I saw a few small parades in the early part of Holy Week, but the countdown to Easter really begins on Holy Thursday. 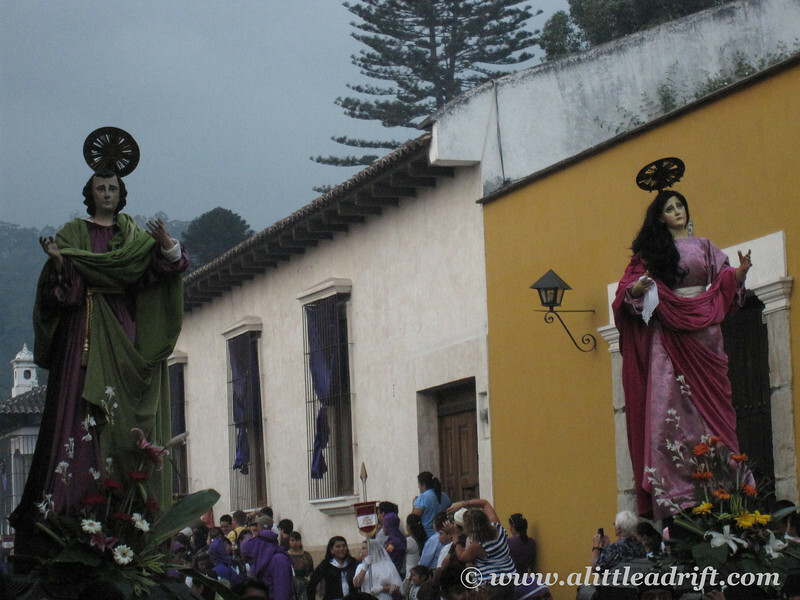 A massive float carried through the streets by purple-clad cucuruchos, float-bearers, forms the heart of each procession. 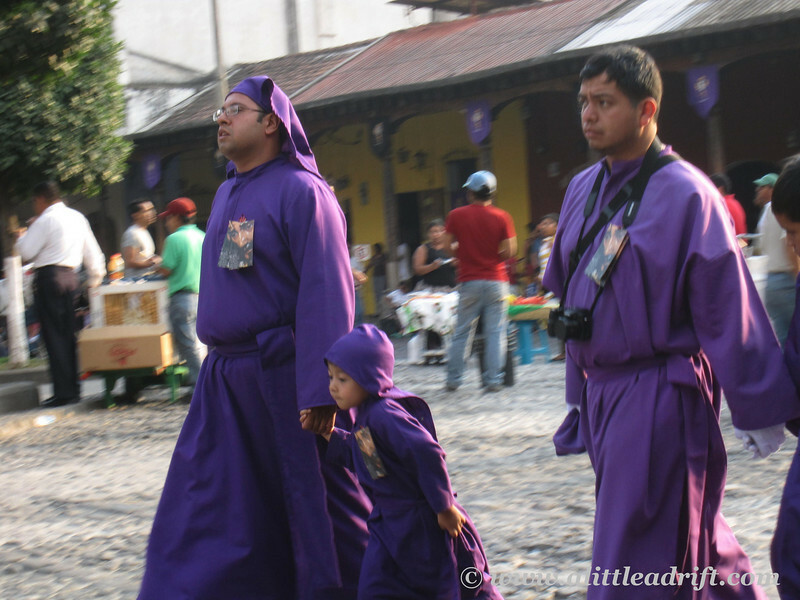 The cucuruchos dress in purple throughout Lent, and on Holy Thursday, too. Being the color of lent, it makes sense and even the children dress in purple this week to mark the occasion. Each processional float represents the stages before Christ was crucified, and carrying a float is an incredible honor. Guatemalans sign up a year in advance to carry one, and each person carries the weight for one city block—some floats are so massive that 80 grown men must shoulder it through the streets during procession. Holy Thursday marks the start of the countdown, and its this night that families and neighbors act on their months of planning and begin constructing their planned alfombras—and offering, of sorts, to the processions on Good Friday. Constructing a carpet lasts anywhere between a couple of hours for the simpler ones, up to 18 hours for elaborate, intricately detailed carpets. Timing is everything for the designers. 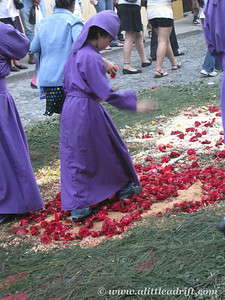 Given that processions take place daily, every neighborhood uses detailed copies of the parade route to plan the location of their carpet so that it will face the key procession that takes place in the wee morning hours of Good Friday—this is the most significant one and it’s for this that the carpets are breathed into existence for mere hours and minutes. Once begun, the clock starts ticking, because there is no escaping the inevitable end for one of these carpets: destruction via feet. The procession will come, and in the final hours it’s all hands on deck to complete each and every one. The size and complexity of Holy Week carpets differs as widely as the materials used to create these beautiful masterpieces. 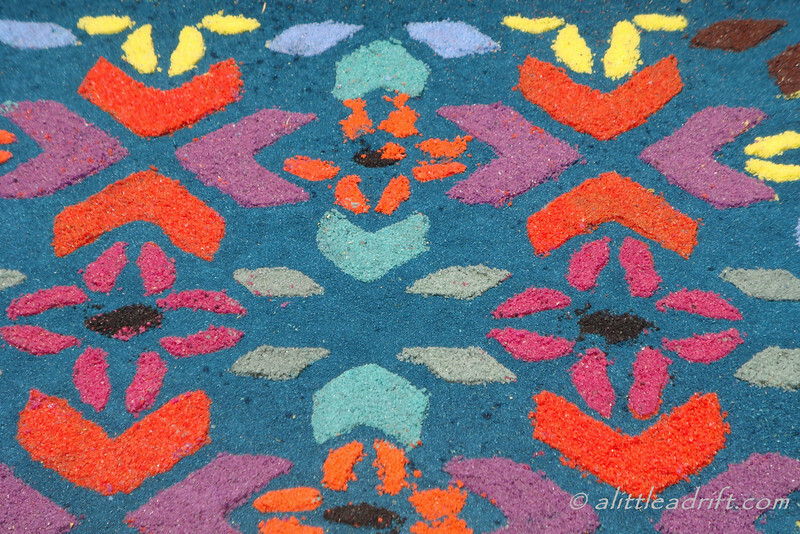 Many of my favorite carpets used richly pigmented sawdust (which stains the fingers for days afterwards!) to create fascinating and intricate patterns—the fine sawdust allowed for nuances and flourishes other materials simply did not. In addition to sawdust, which is surely the most common material, many think outside the box and use whole and cut fruits, fragrant green pine needles, and a range of in-season flowers are just a couple of alternative carpet materials. In some cases, families design an alfombra that showcases the skills of their trade—in one beautiful example, the rich scent of chocolate wafted for half a block. The chocolatier’s carpet was not only a Holy Week offering, but a unique expression of his trade. He may not know flowers, and he doesn’t dabble in sawdust, but this man knows chocolate! His creative display stood out among the many because of the unique creativity that ensured I returned the several times during my wanders for a sniff, and I stopped there at the dark hour of three in the mourning as he added the finishing touches on his carpet. 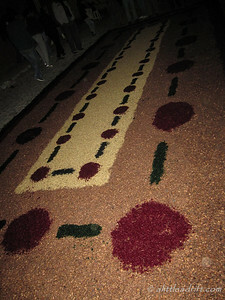 A carpet made from flowers and pine needles. A chocolate carpet! It smelled great. 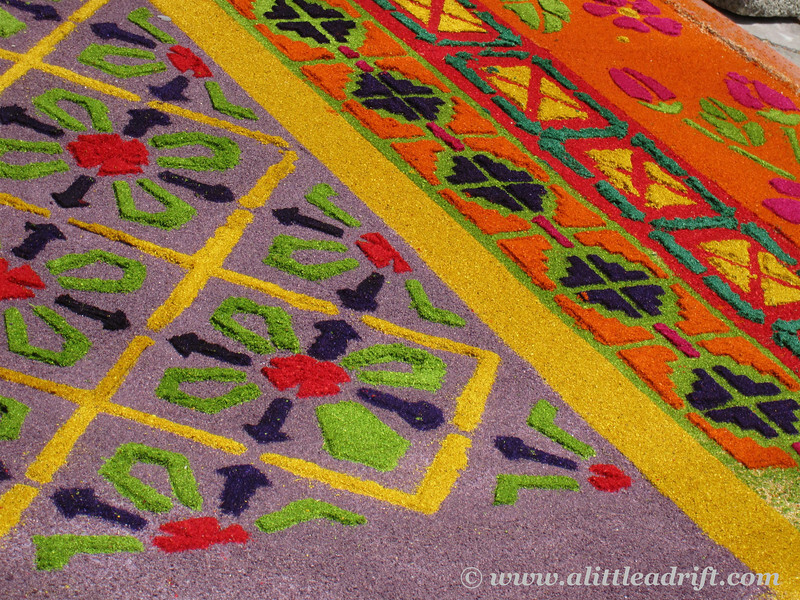 One can easily consider Semana Santa carpets art—just a short-lived form of artistic expression. While they range in creativity and complexity, across each one lies a river of passion and devotion. These are not made on a lark, but rather as a show of faith. Despite gawking tourists like me, that’s just a by-product of these families manifesting their devotion and sacrifices, there is no glory in it other than through their religious beliefs—no one pays to witness or participate, it’s a group activity among Guatemalan locals. 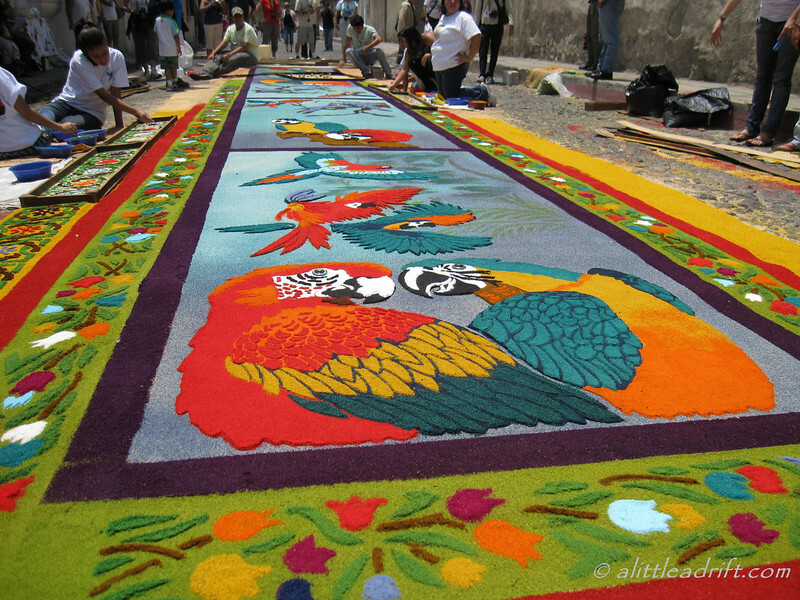 Just like offerings of incense, fruits, and flowers at the alters of other religions, Semana Santa carpets are a Catholic offering and an integral part of Antigua’s Holy Week celebrations. The origin of these carpets is up for debate, but some reckon that the elaborate carpets developed overtime as the religious threw the pine needles to soften the streets for those carrying the load of the major processional floats. True or not, the elaborate scope of the carpets is a competition of sorts, and like grew that way throughout history, too. For all that these are religious endeavors, a spirit of friendly competition erupts as the streets fill with ever-the-more elaborate, detailed carpets. Although there are no prizes, locals find joy in seeing the creations of their friends and family come to life throughout the long day and night. In addition to elaborately decorative floats, reenactors accompany each procession. To witness the true scope of Semana Santa in Guatemala, plan to respectfully walk the streets as Good Friday dawns over the city—it’s this day when you’ll witness the most elaborate and achingly beautiful of the reenactments. 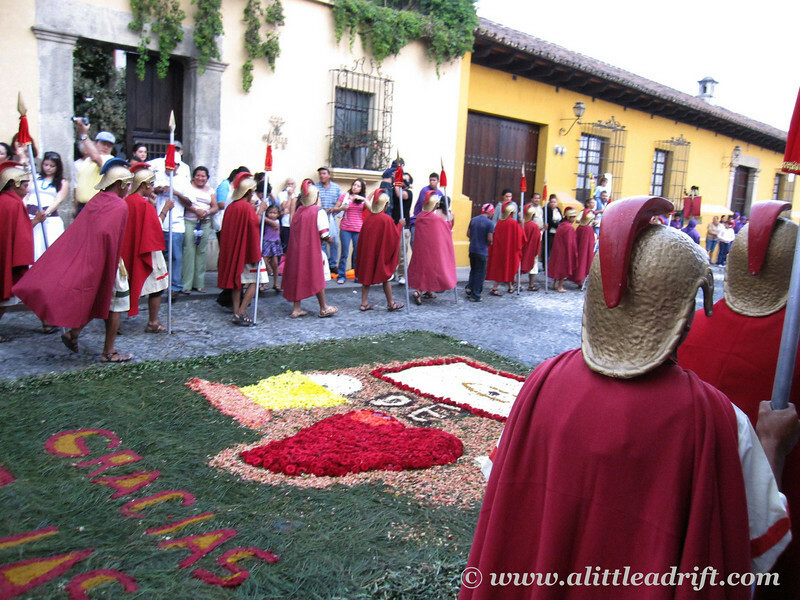 These processions are quiet, and a subdued hum floats through Antigua throughout the early mourning hours of Friday as locals finalize the most elaborate of the Semana Santa carpets. Crowds of spectators patiently wait out the hours until church doors open at four in the morning at four separate churches across Antigua. At the stroke of 4am, Roman reenactors on horseback clomp into the streets, rapidly awakening any Semana Santa celebrants who may have been catching naps in the nearby park. Then the Romans list Jesus Christ’s crimes in a booming voice that lingers over the crowd. At the close of the speech 10 minutes later, they sentence Jesus to death. The Good Friday procession is the most somber, large, and elaborately reenacted. Each procession slowly exits the church once the Romans have read Christ’s sentence. The key float gradually comes into view through the church doors: it’s Christ, bent forward under the weight his cross. 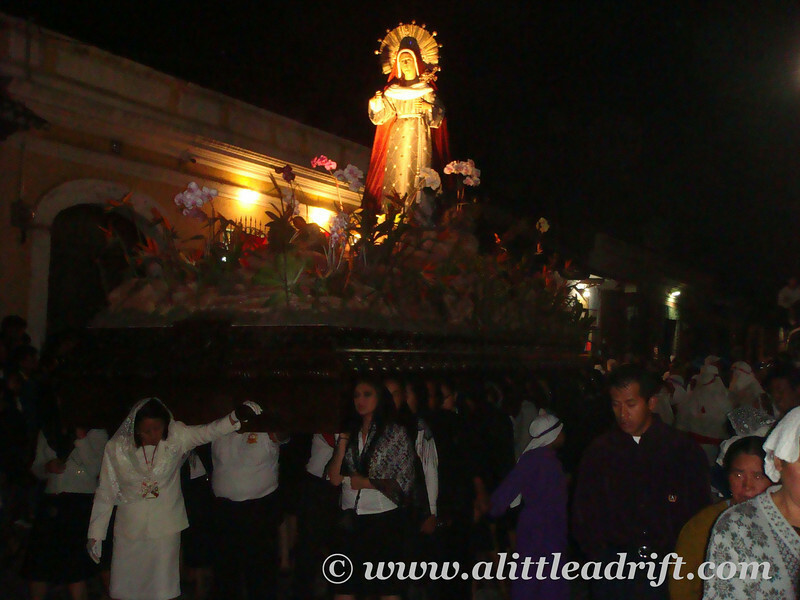 Black-clad cucuruchos now carry the heavy float and the Virgin Mary in Mourning follows every Christ through the streets. 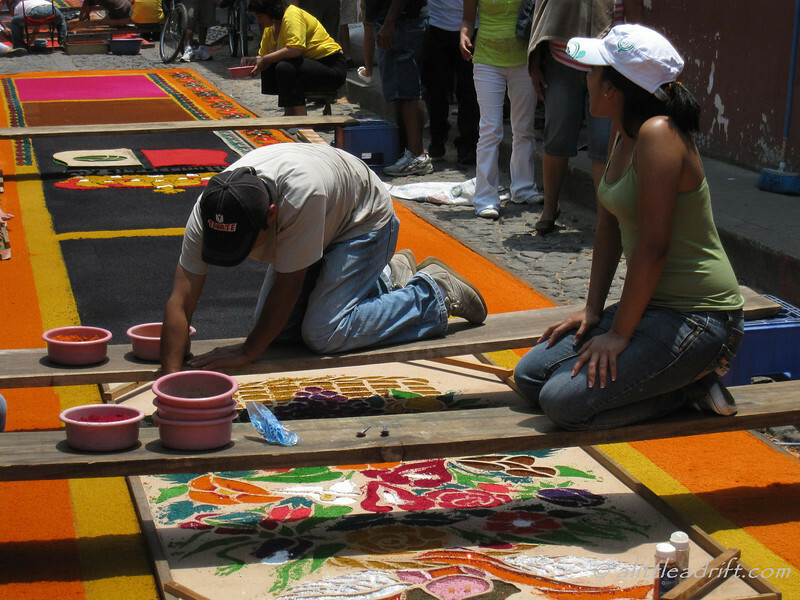 Meanwhile, this is the moment when those making the Semana Santa carpets have just minutes or hours left to finalize each detail, depending on their spot on the parade route. Mourning sounds emanate from the slow procession and echo into the surrounding blocks. The Good Friday processions cover nearly every single street of the city and last more than 12 hours in many cases. Those at the beginning of the parade route have less time than those at the end, but those last moments before the procession descends are the same for all. Everyone adds any final flourishes before heading to a high place—families take to their balconies to watch their carpets from above. Meanwhile, onlookers like me, who have wanted the slow progress on each carpet painstaking unfold across many hours, hold their breath processional footsteps near the alfombras. Only float-bearers walk over the carpets. Each float bears carvings and statues of Christ in his final days, and the carpets honoring the reenactments. Each carpet expresses gratitude, devotion, and service for the Catholics who invested their time, money, and creativity to deliver a worthy gift of honor. It’s all so fleeting, however. It takes mere minutes for the procession to move through a city block and in the blink of an eye, it has moved on, further down the street, consuming more carpets with incense, smoke, and measured footsteps. A team of street cleaners follow behind the procession and before the procession has even turned the corner onto the next block, locals have shoveled, swept, cleaned away the carpet materials. They leave behind in the cobblestone cracks only faint glimmers of shimmering color. 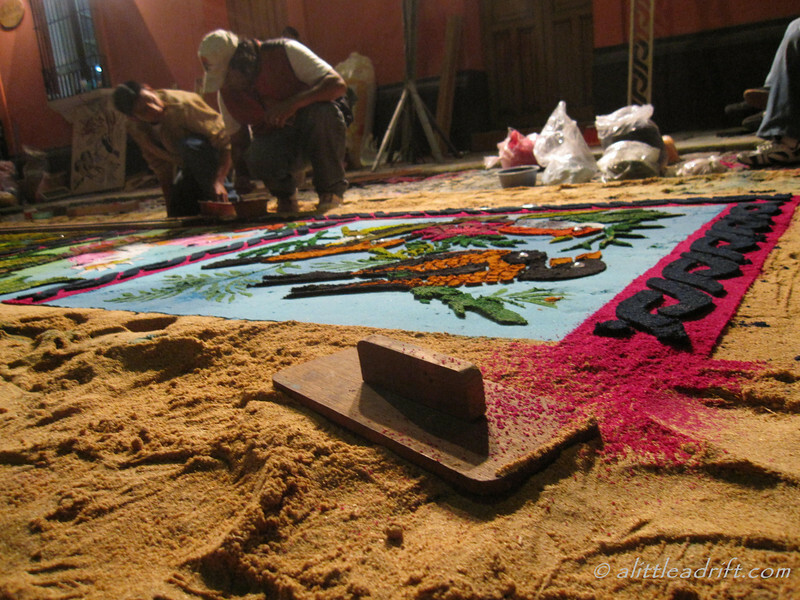 The Semana Santa carpet has lived it’s lifespan through to completion, sometimes remaining “finished” for mere minutes before facing devotional destruction. Four processions divide the city, and by the end of the 12 hours, nearly every single local will have have participated in some way—either bearing a float, constructing a carpet, or carrying the incense that wafts a fog of sage into every side-street and alley. Amazingly, musicians following the procession never trade out with replacements. They’re in it for the long haul and play the slow, sad funeral dirges for the entire time, only taking small breaks as procession attendees pass them water and food, which they consume while still en route. During the Good Friday processions, the entire mood in Antigua sinks, and even the sky took on a darker tint as the potent smell of sage and tinkling music spread the message that Christ was condemned to death. For all of the sadness of Holy Week, the Easter Sunday parade is significantly cheerier, although it’s surprisingly not well attended. It’s a much smaller procession than those that come earlier thin the week, but the dancing and singing is contagious. Like the locals, I was compelled to add a wiggle to my step as Guatemalans performed impromptu pirouettes in the streets and enthusiastically waved yellow and white flags in honor of Christ’s resurrection. There is a huge dose of Catholicism in the Semana Santa celebrations—it is Easter after all—but you needed be even a lick religious to marvel in the contrastingly colorful and somber displays of devotion throughout Easter’s Holy Week. And I daresay that Antigua, Guatemala just may be the best place to truly experience Semana Santa in it’s fullest scope. It’s certainly one of the festivals that I will most remember from my travels. 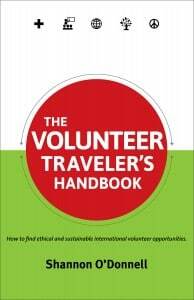 A download on everything I learned from backpacking across Guatemala. It’s one of top three favorite countries in the world—here’s where to go, my favorite places and everything you should know before you go to Guatemala! Anytime intriguing new sweets and street food are involved, I’m interested!! Stunning photography Shannon :) I can’t pick a favourite! I’m pretty sure I commented about these on a previous post, but I still can’t get over the intricacy of those carpets! The parrots are so beautiful and yet it’s sad that all the work is going to be destroyed. I’ve been to Antigua but it was near Christmas time. I’m curious to know if you had a hard time finding a place to stay or if you booked in advance. 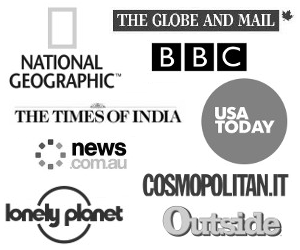 Hopefully, your travel fatigue is wearing off :) Sickness and stresses are tough to overcome on the road! I completely agree – the carpets are pretty much just the most amazing part!